1. Purchase one (1) Sili watch and get one (1) Classic Clear watch for FREE! 2. Purchase two (2) Classic Solid watches and get one (1) Classic Clear watch for FREE! 3. Promo is valid only upon purchase of select Ice-Watch Collections. 4. Free item must be claimed instantly upon purchase from the same store. 5. Not valid in conjunction with any other promos or discounts. 6. Any item received for free under this promotion is NOT valid for Refund/Return/Exchange. 7. NO warranty on free item received. 8. 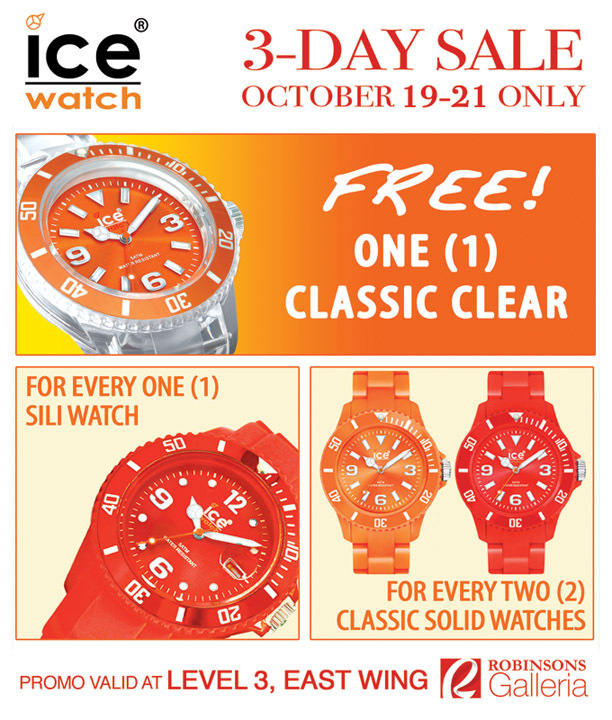 Promo valid at Ice-Watch Robinsons Galleria only. 9. Promo Period: October 19-21, 2012 only. 10. Ice-Watch management reserves the right of final decision in resolving disputes. I really, really want to be a watch person but I can't seem to do it. This sale, however, seems like a smashing deal.